I have been wearing my newest dress yesterday and it happened to be very appropriate for the day: a perfect Saturday afternoon, walking in the city center, enjoying a handmade and second-hand market and discovering a great bar. This is the vintage pattern of the Burda June issue, dress 133. As soon as I saw it on the last page of the May issue as a preview, I knew I was going to buy the next one just for that dress. And it’s true that the rest of the issue was not the best, but this dress was worth it. It’s an halter top with an almost full circle skirt. It’s not particularly difficult but I found it a bit hard to make the lining stand still and not show on the top. I was scared about the piping as there are various angles but I basted the pieces first, which helped. If I was to make it again (which I doubt), I would underline or fuse the top pieces for more support. Well, the dress is nice but I can’t say it lived up to my expectations. But that’s because I made some small errors, not because of the pattern. type of dress in a bold print for a more modern look. Or a contrasted colour for the X shape would be interesting as well. Does someone want to try it? As you can see, the dress liberated some Marilyn poses in me, I felt very Pin-Up next to the swimming pool. The sun is a little bit too bright for me to keep my eyes wide opened but the background is very nice. And I wasn’t feeling like going to the park this morning, so swimming pool it was! A detail photo of the cherry print and piping. And what I found at the handmade market: some very nice jewelry. Belen had a stand at the market (which took place in the afore-mentioned discovered bar) and makes very cute necklaces, rings and hairpins. She also sells them on her webpage: www.bohemismo.com. Go and check it out, it’s a great idea for small presents! 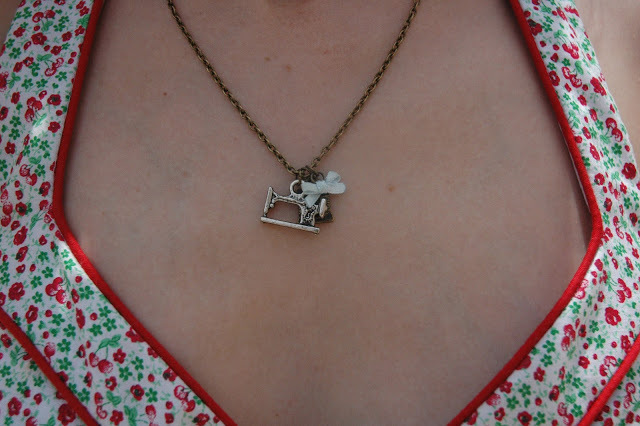 When I saw this sewing machine necklace, I knew it was coming home with me (as well as a croissant necklace! ).